Em oi! #407: What Time Is It? The death of my brother and sister-in-law’s awesome dog, Mac Z”L (pictured in Em oi! 367 and 370). I am sad that he had to go; he was a good dog. The cat’s illness and recovery, alluded to here (note 1). As of this writing, she is still doing well (you may be able to see some pictures of her in the bar to the right). I started to learn how to program computers. 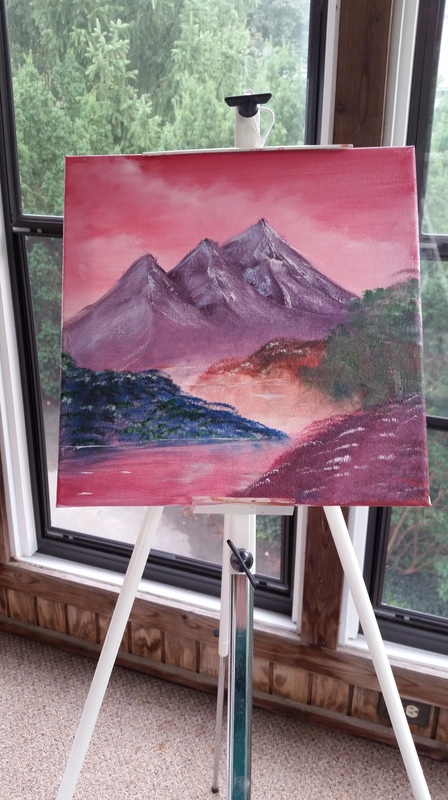 I took up painting, because the stress from watching the election was getting to me and, as Bob Ross put it, I just wanted to be in a world where nothing bad happens. I am going to work harder at ignoring certain candidates for the next few months, I think. My novella, The Joy of Fishes, will be released as a paperback on October 6th. Pursuant to that, I hope to have a website up at ehlupton.com fairly soon. It is mostly designed (thanks to B); I just have to write the text and transfer it over to the new domain. And finally, I’m training for the Twin Cities Marathon on October 4th. Everything has been going well up to this point; my longest run, 23 miles, happened a few weeks ago, and I will be going on taper after this weekend. I am pretty ready to be tapering at this point, so I suppose that’s a good sign. I am hoping the weather will be good and I will go sub-4. TCM was my first marathon, completed SEVEN YEARS AGO. Which brings us to this comic, because seven years ago this past September 6th, I went on my first date with B. A month later, only a day or two after the marathon, we went over to a local athletic club and got a joint membership, and he started teaching me to lift weights. So what is depicted in the comic has basically been my life ever since. Maybe if I get some time I will write down my advice for weight lifting, because I have been doing it for a while now. Or maybe if you’re interested in that I’ll just let you google for it. We’ll file this comic under GV546.3 L86 2015, for (are you ready?) Recreation. Leisure–Physical education and training–Gymnastics. Gymnastic exercises–Heavy exercises–Weight training. Weight lifting. Bodybuilding–Weight lifting–General works. That’s a mouthful, isn’t it? Previous Previous post: Starship Troopers, because why stop with the cheap scifi just when I’m hating myself?